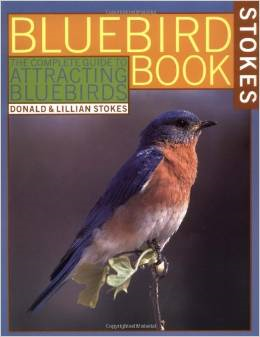 From Amazon: Copiously illustrated with maps, line drawings, and full-color photographs, this large format paperback book contains the essential information that backyard nature enthusiasts want and need -- to attract bluebirds to their yards. About the Authors: Don and Lillian Stokes are widely recognized as America's foremost authorities on birds and nature. 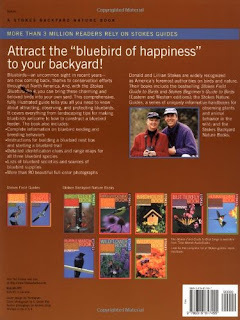 Their books include the bestselling Stokes Field Guide to Birds, the Stokes Beginner's Guide to Birds, the Stokes Nature Guides, and the Stokes Backyard Nature Books. They live in New Hampshire and Georgia. My Review: I love bluebirds, and this book does a great job of telling the reader about them. It is easy to read, concise and full of colorful photographs. Want to learn about these wonderful birds, and don't want to learn about it on a computer, then this is the book for you.